That mental image always stuck with me. And when you are a remote worker it is hard not to imagine all the amazing, cool places you could work from: Bali, or a surf-friendly co-working location, the space station, the Moon, Budapest, Abu Dhabi, Manchu Picchu — so many awesome choices. Why wouldn’t you choose something like that? There are people here who have even designed out a mobile workspace in a van — I am talking 3D renderings. On the home front, my wife and I have considered driving cross-country for the summer, seeing the sights, hanging out with friends…all while I got my work done. That’s the rose-tinted picture that remote working often paints in the brochures. The point of working from home is being HOME. It is sharing in the giggles. It is helping with the tears. It is about your loved ones — your spouse, kids, pets — being the small daily interruptions, and not Milton complaining about his stapler. Working from home is not about isolating yourself from the rest of your home — it’s about being a part of the home. I’ve been on video calls and watched and heard coworkers calm an upset child, share in the joy of a child’s small accomplishment, or even have those kids sit on their lap while we chat about things the kid simply doesn’t care about. Richard Turton working through code while giving his wife a break. As much as we cling to the romantic notion of not being tethered to any one location for work — I think the reality of being there at any moment for my family is far more compelling than those Swiss Alps. It’s a constant reminder for many of us that we get the best of both worlds: to have an amazing career, and to see our kids whenever we want — and yes, occasionally when we would rather them not barge in to ask where their My Little Pony books are. 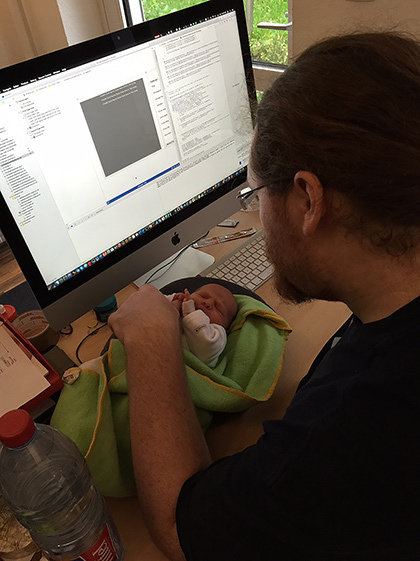 Alex Repty watching his newborn while reviewing code. 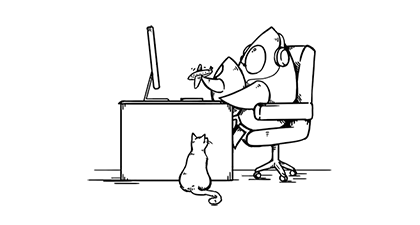 I’ve been a remote employee for just over a half of a year now, and I can already tell you that I couldn’t imagine taking a job where I couldn’t work remotely. 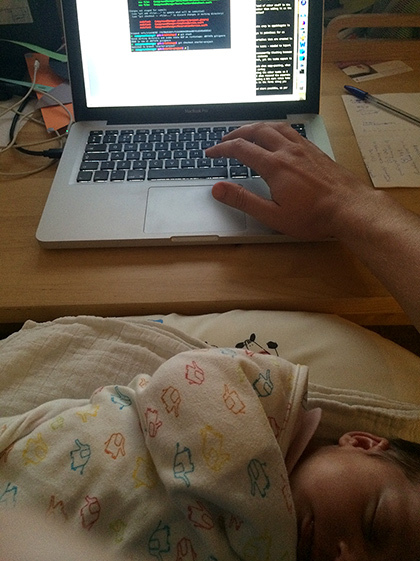 My kids don’t cry when I start work, because to them work is just daddy being in that room. Just a door away.